I’m sure you’ve seen it all over the internet and Pinterest – the Eclipse card technique. 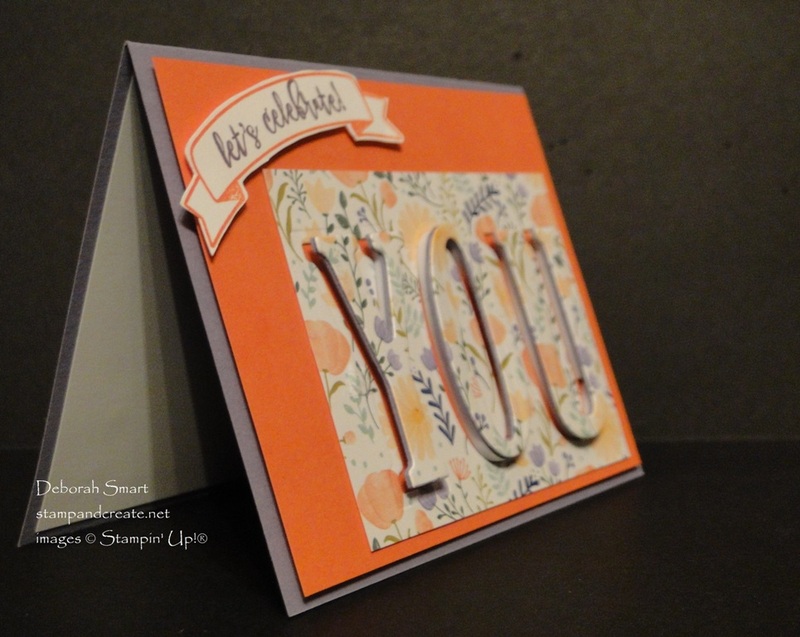 It’s a wonderful way to combine stamping, or using pretty designer paper, with die cutting. The first trend was using Stampin’ Up!’s Large Letters and Large Numbers Framelits, but you can also use image outline dies as well. 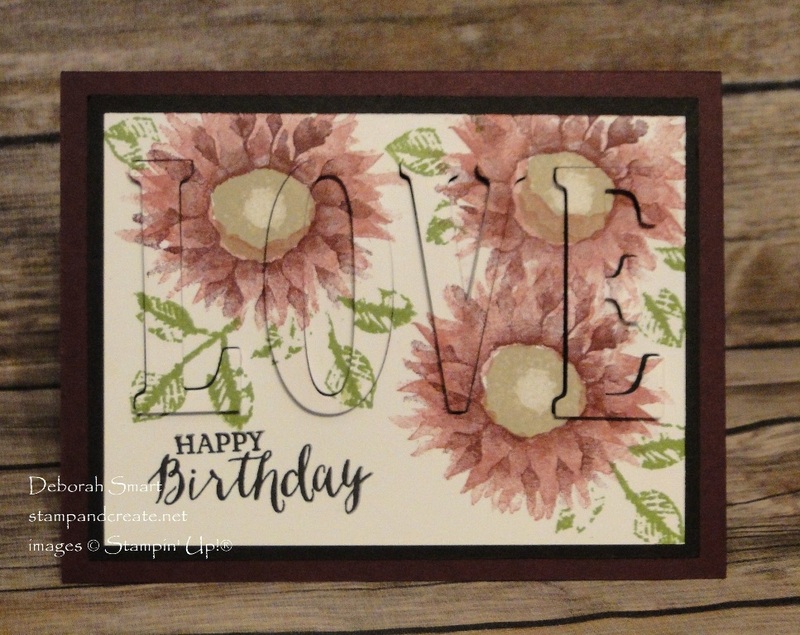 My friend and team member Lynn, created this beautiful card using the Large Letters Framelits and the Painted Harvest stamp set. Isn’t this beautiful?! The stamping itself is so pretty, but when you pop up the die cut letters, it’s even more special. Here’s a side view, so you can see the detail. This next card I created for a friend, for her to send to her special aunt. Her aunt has difficulties with her vision, so when I create a card for her, I make sure that there is texture for her to touch. I thought that the eclipse technique would be fun! 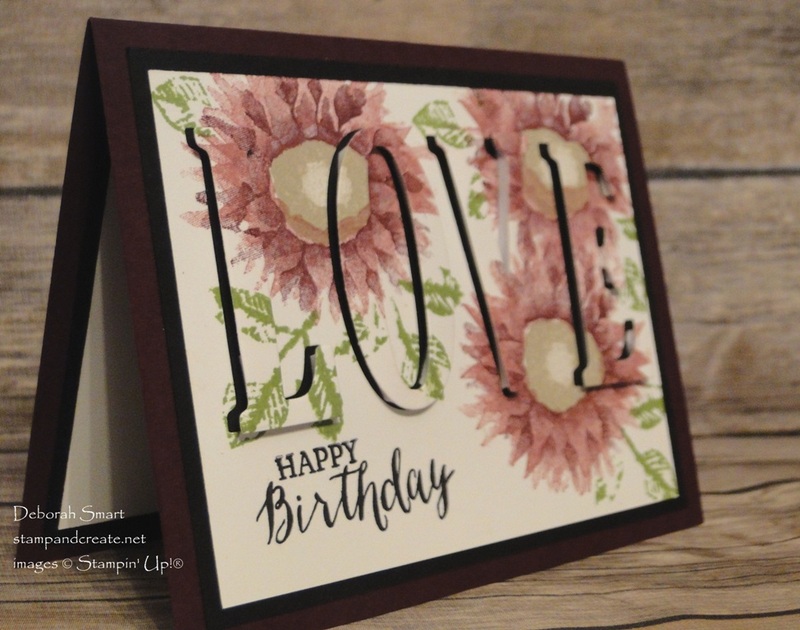 For this card, instead of stamping images, I used the Delightful Daisy Designer Series Paper from which to die cut the letters. I first laid out the letters, and measured so I knew the size of panel I would need for die cutting. Next, I attached the DSP panel to a same-sized panel of Calypso Coral cardstock with Multipurpose Liquid Glue. Then I die cut the letters, saving the inside piece to the letter ‘O’. The sentiment is from the retired Balloon Adventures stamp set, stamped in Wisteria Wonder ink with the banner in Calypso Coral ink. The Duet Banner Punch is used to then punch it out, and it’s added to the card front with Stampin’ Dimensionals. The front panel is then attached to the Wisteria Wonder cardstock card base, with Dimensionals. Here’s a side view of this card, as well. I’m looking forward to making some Christmas cards with this technique, as well as more birthday cards. Really, it can be used for any occasion! So while the investment in the Large Letters Framelits may seem a bit steep at first, remember that you can use them for any type of card, and really for any project! Whenever you need large letters – for banners, monogrammed gift items or tags – even using the negatives of the die cut as stencils; you can use these framelits for years to come. You can order your Large Letters Framelits right now, through my online store. It’s always open, so you can shop whenever you like! Just click on either my signature to get to the storefront, or on the individual product icons below, to go directly to each item. Thanks for spending some time with me today, and if you choose to order – thank you very much! I always appreciate it when you choose me as your demonstrator! 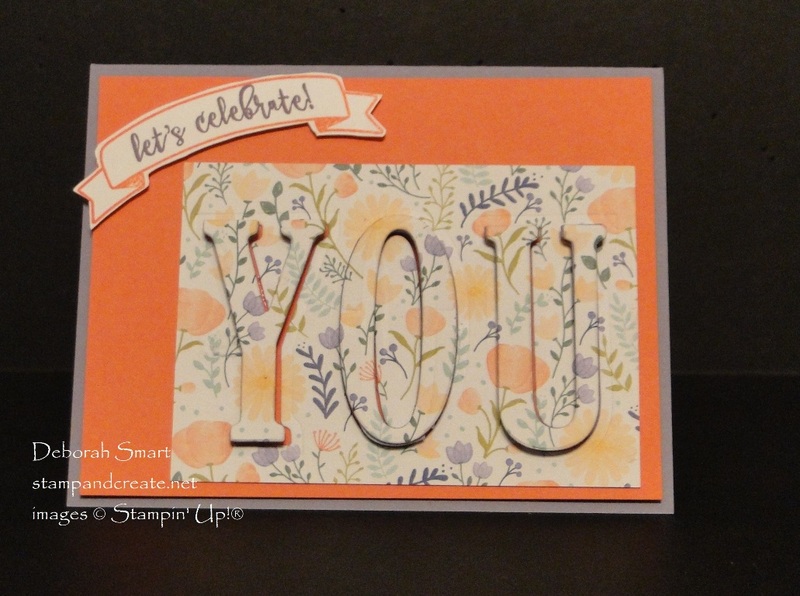 Previous Previous post: STAMPIN’ BLENDS AVAILABLE NOW! Haha! Sorry – I didn’t realize my old popup was startling! 🙂 I hope the projects made up for the rude surprise, Susan! Love both cards, Deborah! Thanks for the tips (about the center of the “O,” and about the pattern. Learned that one the hard way! ).